Frisson Wines and Masraff's kicks off 2015 by featuring our full portfolio of wines with a four course dinner. This includes our newly released 2011 Napa Valley Cabernet Sauvignon as well as our sold-out 2009 Diamond Mountain Cabernet Sauvignon. For information call Masraff's at 713-355-1975. Hooray for Rain! Holiday $10 Shipping on our 2012 Chardonnay and 2010 Cabernet Sauvignon 750 ml. We are happy to offer $10 shipping on our Cabernet Sauvignon and Chardonnay 750 ml bottles, flat rate for any quantity, one bottle to six cases. Good now through January 4, 2015. 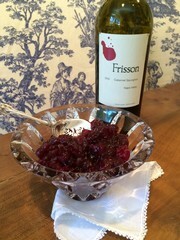 Look what WineWatch TV says about Frisson! "10 Frisson Napa Valley Cabernet Sauvignon (Napa Valley): Quite beautifully stated, and in a manner that's refreshingly understated. $60 A-." Thanks, Wine Dude! Napa quake an unwelcome thrill! We might have been thrown out of our bed, but our wines rested easy. After seeing our wine storage facility on TV, we rushed down to Napa to check it out, and were relieved to find all inventory intact, including our just bottled 2011 Frisson Napa Cabernet Sauvignon. Our thoughts and prayers to out to all who have suffered from this frightening event. The Critic's Challenge International Wine Competition recently honored us with a Platinum and a rating of 94 for our latest Cabernet Sauvignon. Our Dutton Ranch Russian River Chardonnay also earned Silver. 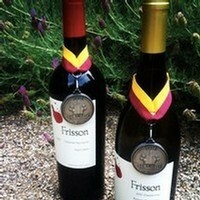 Our 2010 Napa Valley Cabernet Sauvignon earns Platinum!